I want to replace my current floor with ceremaic tile. My room is l shaped. What is my total square footage? And how many boxes do I need? The easiest way to do this is to simplify the room into rectangles. We then add those together to get the raw square footage. You should then add 10% to that number for cuts and waste. The result will then be divided by the square footage per box (round up to the nearest whole number). That will be the number of cases you buy. You can see that I divided the room into two rectangles. 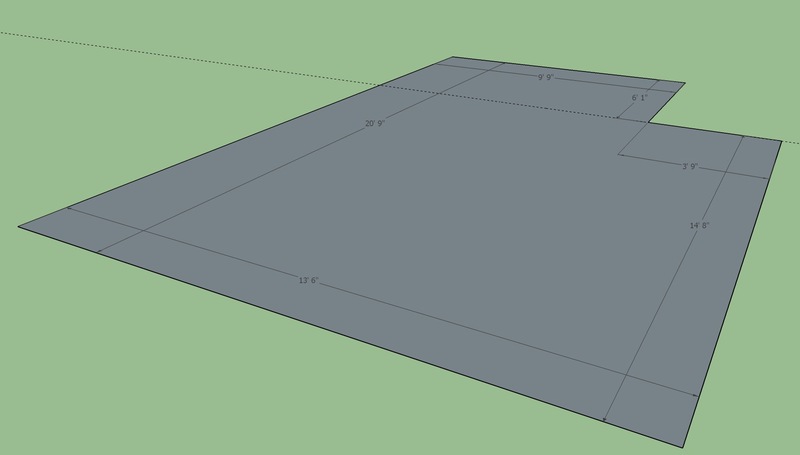 One is 14' 8" x 13' 6"= 198sqft, the other is 9' 9" x 6' 1" = 59.3125sqft. We then add those together to get 257.3125sqft. Now we add our 10% (25.73125) giving us 283.04375sqft. For simplicity and the fact you will buy whole cases, just make it 283sqft. We now divide 283sqft by the amount per case of 14.53sqft giving us 19.477. Round that up to 20 cases.